Transportation • Permanent protected lanes will take away at least a third of parking slots. 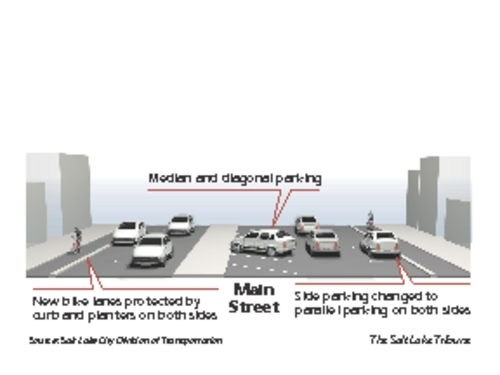 Steve Griffin | The Salt Lake Tribune Traffic information is painted on 300 South near 200 in Salt Lake City, on Friday where protected bike lanes from 600 East to 300 West will require the loss of about one-third of curbside parking because angle parking will change to parallel parking to make room for the bike lanes. Steve Griffin | The Salt Lake Tribune Traffic information is painted on 300 South near 200 in Salt Lake City, Friday, August 29, 2014 where protected bike lanes from 600 East to 300 West will require the loss of about one-third of curbside parking because angle parking will change to parallel parking to make room for the bike lanes. Broadway cycle track Protected bicycle lanes will soon appear on both sides of Broadway (300 South) from 300 West to 600 East. The changes to each block will vary based on width, existing lane use, traffic volumes and parking configuration. The $900,000 project should be completed by mid-October. 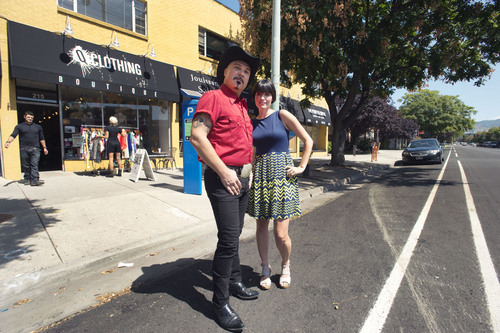 Steve Griffin | The Salt Lake Tribune Michael Sanders, owner of Now and Again, and, Amy Leininger, owner of Q Clothing, stand in the street outside their stores on 300 South near 200 in Salt Lake City, on Friday. Protected bike lanes from 600 East to 300 West will require the loss of about one-third of curbside parking because angle parking will change to parallel parking to make room for the bike lanes. Stores owners like Sanders and Leininger will loose a majority of the parking in front of their stores. Steve Griffin | The Salt Lake Tribune Traffic information is painted on 300 South near 200 in Salt Lake City, Friday, August 29, 2014 where protected bike lanes from 600 East to 300 West will require the loss of about one-third of curbside parking because angle parking will change to parallel parking to make room for the bike lanes. 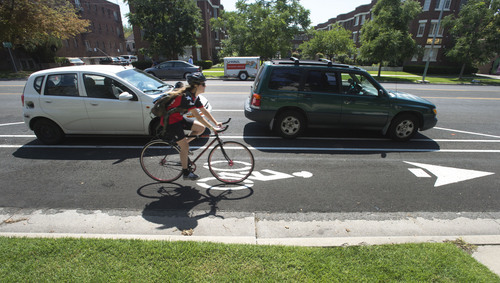 Steve Griffin | The Salt Lake Tribune A cyclist travels in the bike lane between the curb and parked cars on 300 South near 300 east in Salt Lake City, Friday, August 29, 2014. Protected bike lanes from 600 East to 300 West will require the loss of about one-third of curbside parking because angle parking will change to parallel parking to make room for the bike lanes. There are funny-looking parking spots painted up and down 300 South downtown. Bike lanes are this way and that. Workers are paving and jack hammering  and, simply put, between 600 East and 300 West, things are a mess. 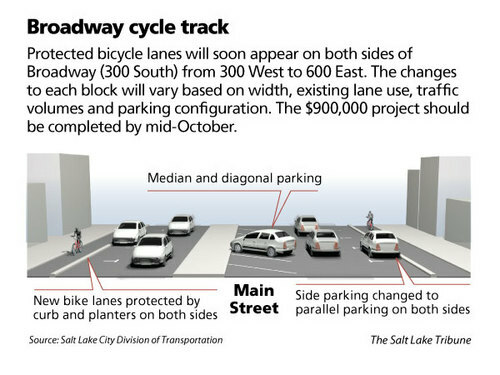 But don&apos;t worry, say Salt Lake City officials, when the dust clears  about mid-October  the city will have its first permanent protected bike lanes on both sides of what some still call Broadway. It&apos;s a work in progress, said City Hall spokesman Art Raymond. The goal of protected lanes is to beckon cyclists downtown who are otherwise not inclined to ride in auto traffic, he said. It may bode well for cyclists. But small businesses along the street say the project will rob them of about one-third of the curb-side parking slots  their life blood  and spell doom for their shops. "I don&apos;t think the folks that planned this took into account the impact it would have on this business district," said Michael Sanders, of Now & Again, 207 E. 300 South. By contrast, the city believes increased bike traffic will bring more business to those shops. According to information provided by City Hall from Long Beach, Calif.-based Green Octopus Consulting, "there is a strong connection between biking and shopping local." The city has had a protected-bike-lane pilot project on 300 East from 600 South to 900 South using removable plastic poles. 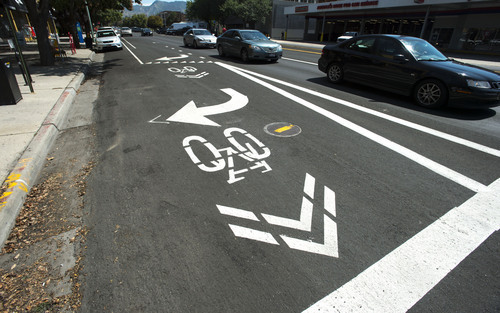 Although that street is not a shopping area, the project has helped inform officials how to construct and maintain the new protected bike lanes, Raymond said. The protected lanes on Broadway will run between the sidewalk and a concrete parking curb from 300 West to 600 East, except from Main to State and 300 East to 400 East, where painted bike lanes will run next to automobile lanes. The new bike lanes, however, will require that angle parking along the street be changed to parallel parking. That will result in at least a 30 percent reduction in curb-side slots along Broadway, much to the chagrin of merchants. "There aren&apos;t words," said Pam O&apos;Mara, of Utah Artist&apos;s Hands, 163 E. Broadway. "The city told us we would lose up to 40 percent of our parking," she said. "In what world  where all these small businesses are locally owned  does that exist?" O&apos;Mara said she is a proponent of bicycles in the city. But she added that City Hall has all but forgotten small businesses. "It&apos;s very upsetting to have this happen," she said. "It&apos;s sad." Up the street at Carmen Miranda&apos;s Antiques, 241 E. Broadway, Carmen Arthur is angry. "This was a done deal without any input from business owners," she said of the 300 South cycle track. "They keep talking about how they love small business and shop local. And then they do these things to us." When the city installed the blue automated parking kiosks about three years ago, some of her patrons told her they wouldn&apos;t come downtown again  and, she said, many haven&apos;t.
"They alienate people from my business," she said. "And now they&apos;re taking away the parking we have left." And she&apos;s not buying the argument that the new bike lanes will bring more traffic through her shop. "I have very few people who pull up on a bicycle, load up and pedal off." City Council Chairman Luke said the municipality should seek public input during planning  not afterward. The 300 South cycle track project is reminiscent in some ways of the proposed "road diet" on Sunnyside Avenue, he said, where planners did not seek enough public input during the planning process. "That&apos;s something the city should pay more attention to," Luke said. "When we don&apos;t look comprehensively, this is the sort of trouble we get into." 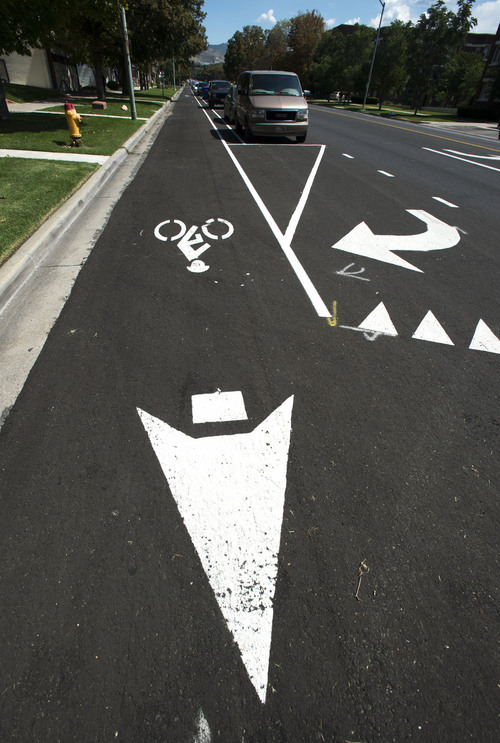 But City Councilman Luke Garrott, whose District 4 encompasses 300 South, said the protected bike lanes will be a good thing for Salt Lake City. And, he said, they are overdue. Although Garrott said he&apos;s sympathetic to the local businesses, he noted that the city is working to minimize the loss of curb-side parking. "Like many Western cities, we have overbuilt for automobiles," he said. "A separate, protected lane is good for bicycles and bicycles are good for business."